At Take Five Café, we’re all about incredible flavour profiles that pair good, simple honest flavours to create unique celebrations of taste. 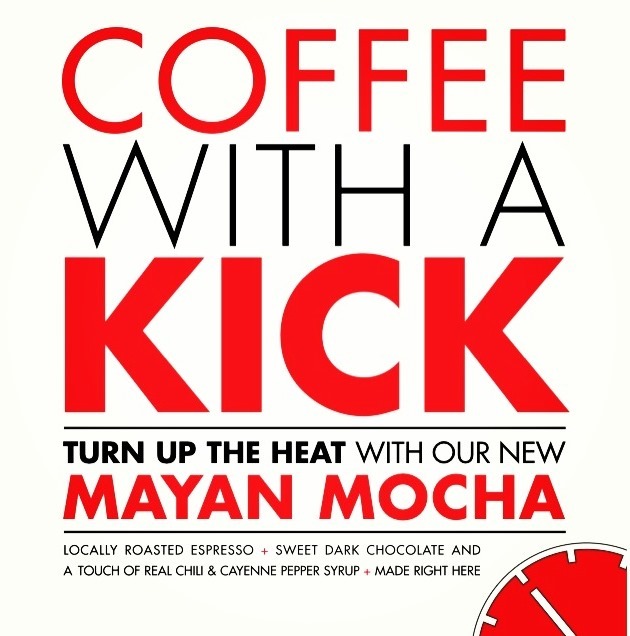 This month, we’re featuring the Mayan Mocha. It’s an espresso-based beverage made with our custom locally roasted espresso and sweet dark chocolate. It doesn’t end there though. Our flavour creators have made an exclusive syrup from scratch – with real cayenne and chili peppers. It’s a touch of savoury spice paired with the sweetness of espresso and chocolate. We’re positive you’ll be hooked with just one sip. Feel free to customize to your own preferences as well. Let your barista know if you’re up for double the spice! Or tone it down and just go with half. It’s completely up to you. Credit for this creative combination goes to Carolina at our Venables Café who is always dreaming up fresh combinations for us to try and some beautiful latte art to admire. So next time you’re in the area, stop by any Take Five Cafe location and enjoy a Mayan Mocha; we guarantee it’s coffee with a good kick.